Fort Grey, or the ‘Cup and Saucer’, guarded the west coast of Guernsey for centuries. 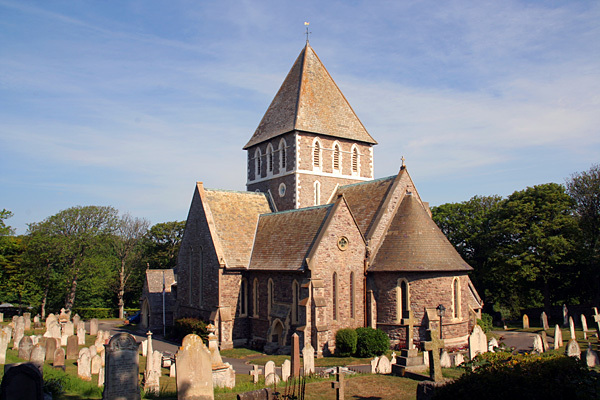 St Anne’s Church, standing in the middle of Alderney, rises like a miniature cathedral. 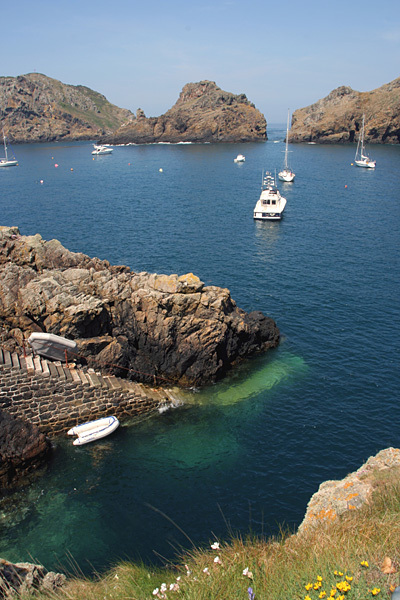 The rugged harbour of Le Havre Gosselin lies between the islands of Sark and Brecqhou. This is one of two guidebooks that replaces Channel Island Walks, the other being Walking on Jersey. All the routes in the old guidebook were checked and updated, and new routes were added. The new guidebooks are in full colour and contain the most up-to-date mapping produced in the Channel Islands. Guernsey, Alderney, Sark and Herm are featured in this guidebook. There are 19 one-day walks around Guernsey. 14 of those walks exploring the coast can be joined end-to-end to make a complete coastal circuit taking two or three days to walk. Guernsey’s landscapes are mostly gentle, though there are impressive cliffs along the south coast and other parts of the coast are occasionally rocky. There is a tremendous amount of variety, ranging from sheer cliffs to level fields, with wooded valleys, villages, splendid country mansions, quaint farms and the bustling town of St Peter Port. There are 5 days of walking around the smaller islands. Alderney and Sark could be explored on day-trips, but it is better to spend at least a couple of days on each island. The tiny island of Herm is an absolute gem and a firm favourite with all who visit. One thing that strikes visitors at an early stage is the amount of history and heritage available. Guernsey has been battered and bruised by centuries of conflict and all kinds of fortifications have been raised in response. When the Channel Islands were declared indefensible during the Second World War, Nazi forces invaded and occupied the islands, building massive concrete structures around them. It is hardly possible to walk anywhere on Guernsey without being constantly distracted by heritage features, as well as plenty of places offering food and drink, so that each deceptively short walk ends up taking all day to complete! Although Guernsey and Jersey are long-standing rivals, the islands have thrown their weight behind an exciting long-distance island-hopping trail - the Channel Islands Way. 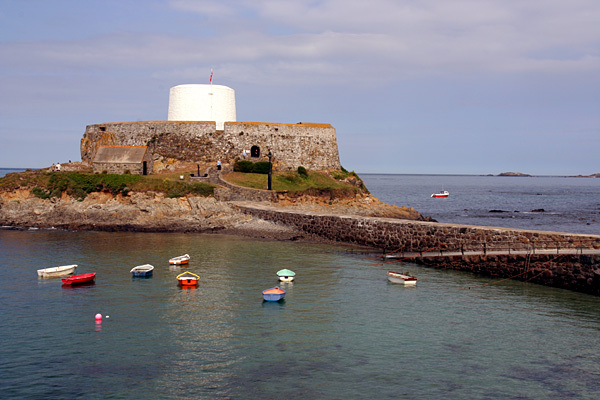 This route wanders all the way round the coast of Guernsey, Alderney, Sark and Herm, then makes a circuit around Jersey, taking in all that is best in the Channel Islands.